2013: Cruz cosponsors resolution at the Republican National Convention to oppose Common Core; signs letter to the Labor-Health and Human Services-Education Appropriations Subcommittee calling for the defunding of Common Core. 2014: Cruz cosponsors Sen. Lindsey Graham’s Senate Resolution 345, denouncing the coercion of states into accepting Common Core. 2015: Becomes the first Republican to announce candidacy for 2016 Presidential election; is first to sign the Eagle Forum STOP Common Core Pledge; cosponsors Sen. Vitters’ Local Control of Education Act, prohibiting the government from mandating specific academic standards. 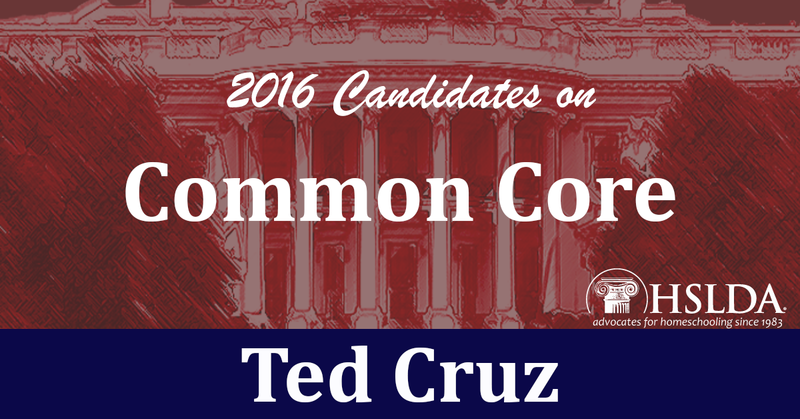 SUMMARY: Ted Cruz has remained consistently and strongly opposed to Common Core. Ted Cruz is the real deal. I read his book, “A Time For Truth” which I encourage everyone to read. Glad to see the HSLDA is looking at records of these candidates. How is your real deal on cheating and lying on other candidates? Main stream media twitter populist zombie. Anyone who listened to the CNN report about Ben Carson in Iowa, would have thought the same thing as the Cruz staffer. A sincere mistake only. Cruz cannot personally supervise every single staffer or volunteer. He is as honest as the day is long. Good article. 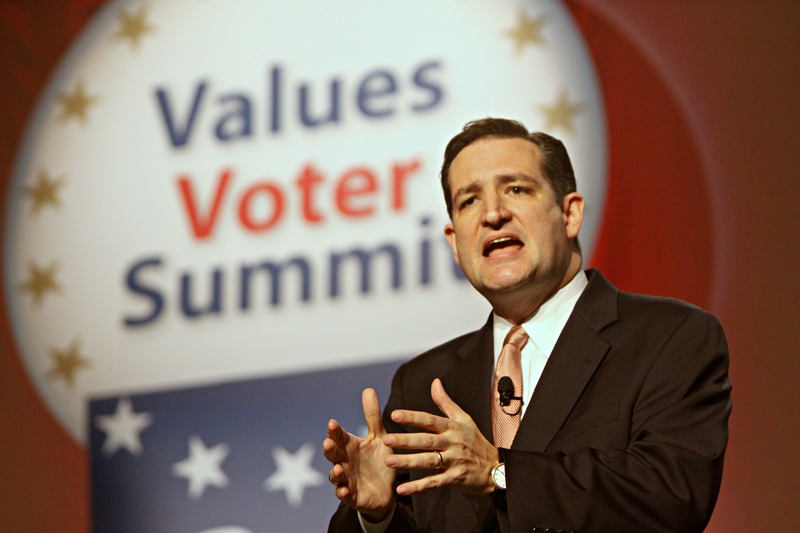 Ted cruz has consistently opposed common core. Fight on Senator Cruz. You are the true Conservative we need to lead our Country. Ted Cruz is the only tried, tested and found still standing conservative. He is the guy we can trust to appoint judges who will uphold the law and the Constitution. Ted Cruz is the best candidate to run for President in my entire lifetime…and I’m almost 64. He memorized the entire US constitution, before even starting his first job in government service. Senator Ted Cruz did NOT VOTE in December for the final passage of the federal education bill ESSA, The Every Student Succeeds Act. He could have voted no, but he didn’t vote when this piece of federal legislation solidified Common Core in every state. This contradicts that he wants to get rid of Common Core — because in the end he did nothing to prevent it from happening. I also did not hear Senator Cruz debate the parts in the legislation that removed states’ rights. As a “Constitutional” Attorney Senator Cruz did not say ONE WORD about the loss of 10th Amendment State Sovereignty Rights. The ESSA law removes and dissolves legislative states rights through this federal education legislation. The legislation requires that when a state puts the ESSA federal legislation into their budget, state legislatures must completely abide by the federal Common Core mandates. This creates a constitutional crisis. Senator Cruz did NOT mention this vital section in the bill. Not once. His silence is deafening on many of the Constitutional issues within the ESSA federal legislation. Senator Cruz is helping the greedy corporations. AND even if he abolished the Department of Education he wouldn’t be able to get rid of Common Core even if he wanted to, which he doesn’t, no matter what he says. The Department of Health and Human Services will have more power over schools under health and mental health through Obamacare. Promise Neighborhoods, initially funded by ObamaCare, are funded to turn your neighborhood school into school-based clinics. Federal health and mental health goals for your children coincide with Common Core subjective/non-academic standards. Essentially, schools become part of a “medical model.” Why would this be a good thing and why does Ted Cruz not have a problem with it? I could go on and on. Even Ted Cruz’s proposed Choice Plan. S 306 is the plan to totally control all children in every school in the United States by using Title I and IDEA for federal school CHOICE. Even homeschoolers won’t be safe after it’s implemented. Ted Cruz is my pick for Prez. I watched his “filibuster” all night long until he stopped. He was as gracious and intelligent every moment as he was the moment he began. He makes the most sense to me. The criticism of him being a first term Senator like the current President, let’s face it, Senator Cruz has been much more engaged than just being “present”. The references to him being the most hated man in the Senate are actually encouraging. If he was compromising, Co sponsoring bad bills, being in with the crowd, would you really want him as your President? I’d love to know what his I.Q. is. Common Core is NOT a federal program, and even if Cruz were elected, he would not be able to “repeal” it – unless he were to use the Department of Education. What about bill S 306? I can’t find anything about HSLDA’s stance on this. Ted Cruz sponsored this but it appears to put homeschoolers under federal regulation. It doesn’t. It helps protect homeschoolers from tax discrimination. Lord Jesus I call on you to make Ted Cruz our 45 president of the United States Of America! We are fighting against principalities not just evil men so I call on You Lord Jesus to make it happen.